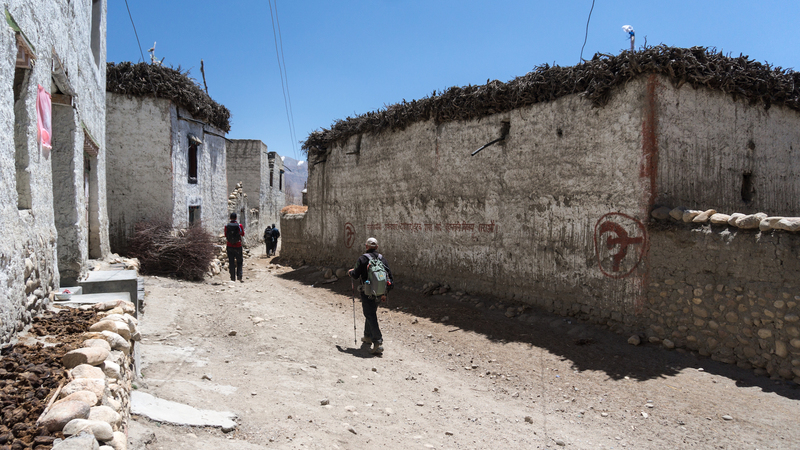 We had taken four days to walk up the Kali Gandaki from Jomsom to Tsarang. 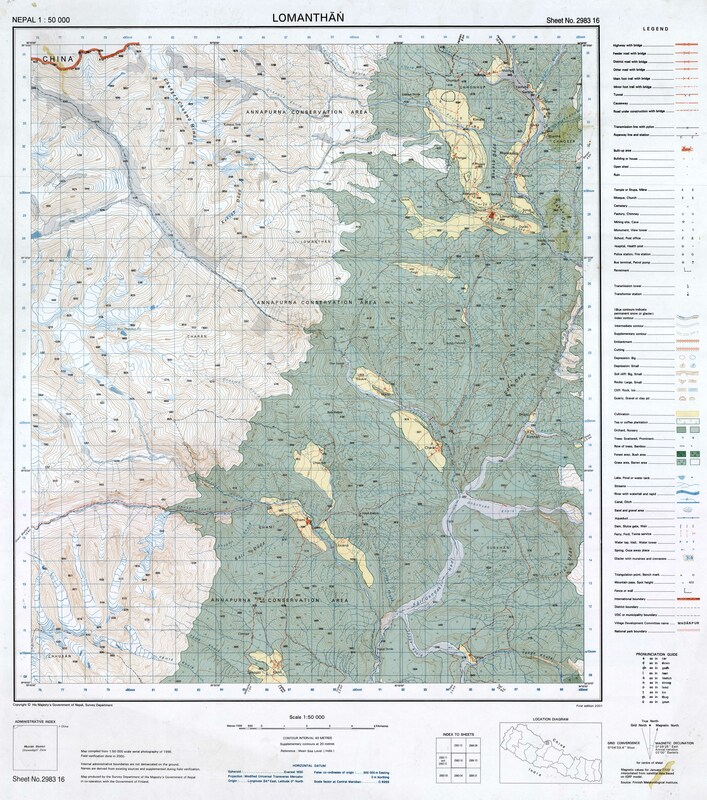 Elevation gain was moderate; from 2720 meters we had moved up to Tsarang’s 3560. We did 2/3’s of our walking in the mornings, thus avoiding the worst of the sun and the wind, which seems to pick up in the afternoon. We sometimes benefitted from the morning shade created by the sides of steep valleys we walked up. Now we had a rest day – actually, the only one of our trip! What to do? I had asked about the cost of a jeep to Lo Manthang; $150. U.S. for the day was the answer, a bit much for the thirteen-kilometer ride up to the capital of the once Kingdom of Lo with its famous village walls and three ancient (well, 500 years old!) gompas. 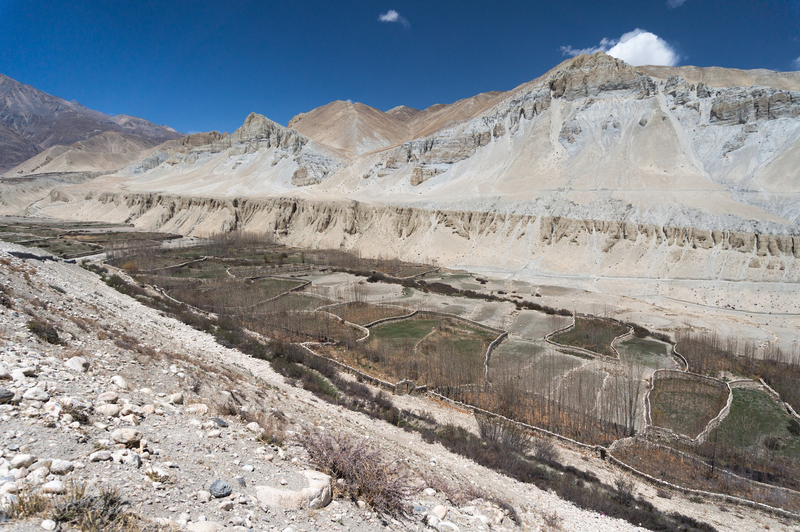 Since no one else expressed an interest in making the ride up to Lo Manthang, I let the possible visit drop. 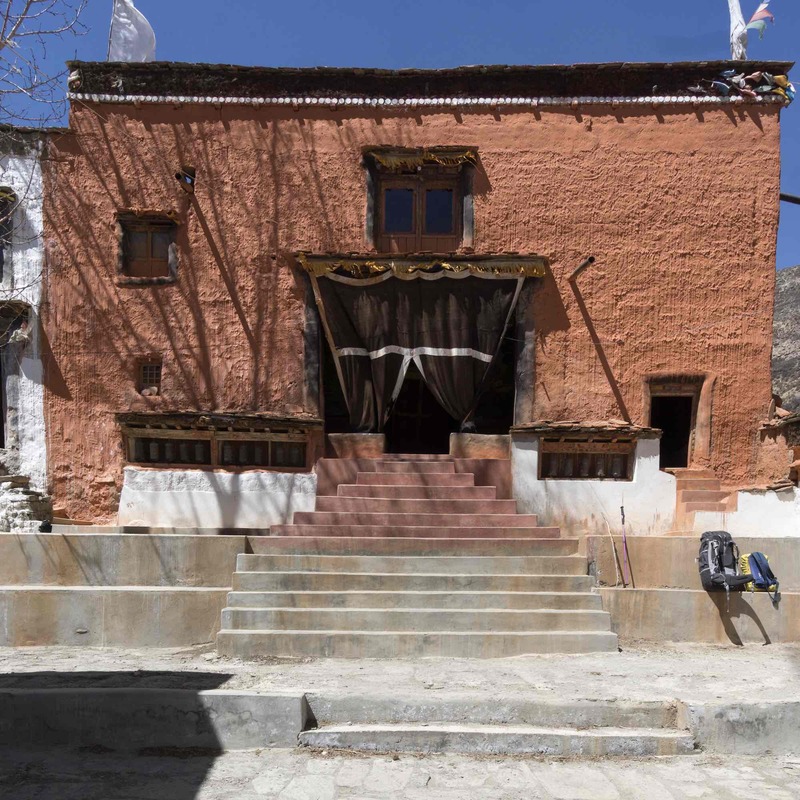 While it does seem strange to come within a day of Lo Manthang and yet not include it in the itinerary, our day in Tsarang did give us the time to visit the monastery and royal palace and walk up the valley to Ghar Gompa, said to be one of the oldest in Nepal. Had I rushed off to Lo Manthang I would have had to miss some of that. I also walked back to the entrance of the village to take a closer look at the entrance chorten. the west face image – Thanks to fellow trekker Muz for the shot! 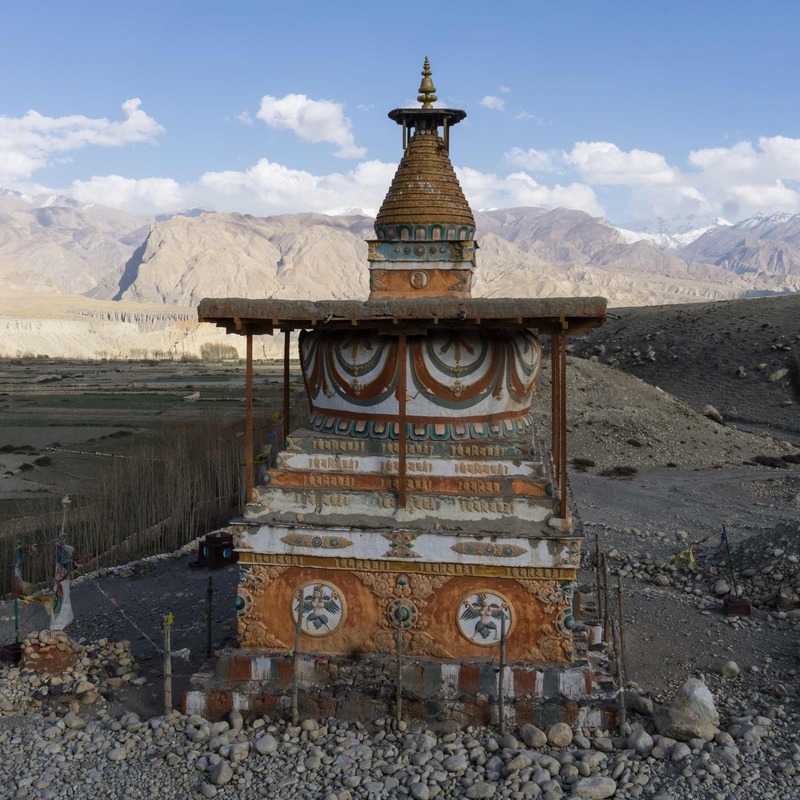 Of all the chortens we saw in our almost-three-week walk in upper Mustang and then the Phu/Naar valley, this one was the most elaborate. We approached it on the road coming down from Tsarang La. A barbed wire fence surrounded the base and it looked like some less-than-urgent repair work was underway. Cracks in the crumbling plaster, peeling paint – it needs some attention. 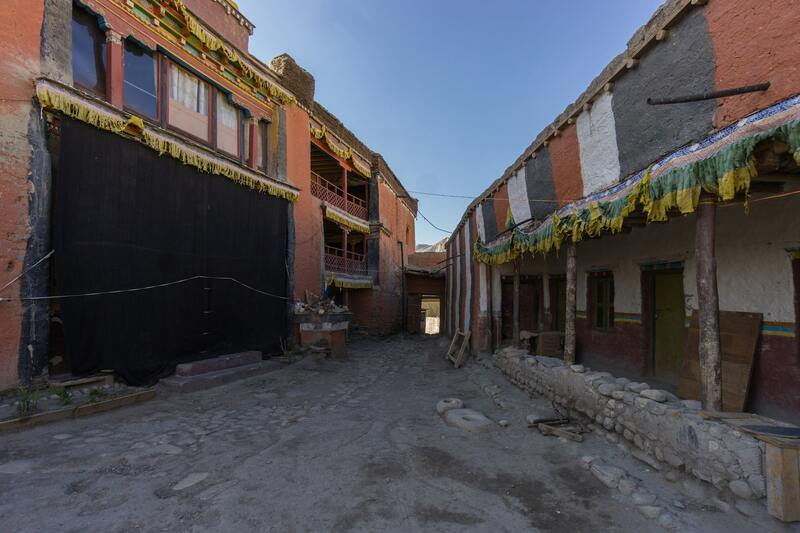 Both the monastery and the dzong/royal palace are a short walk from Maya’s Inn. We went up in the early evening. First, the monastery. It seemed all but abandoned as we walked into the compound. In the image below you see the gateway we came through. On the left is the main temple, whose doors are hidden by the black curtain. The building on the right-hand side seemed shut down. Nearby was a pile of lumber and other construction material, but it wasn’t clear what was being worked on. Administrative offices were on the south side of the courtyard and the living quarters are on the west side as shown in the image below. In front of a couple of the doors were shoes and other indications of human presence but, all in all, the place seemed empty. Our guide did find a monk whose English was good enough to make for an interesting visit to the main temple. He pulled back the black curtain, unlocked the doors, and in we went. Unfortunately, no photography was allowed. 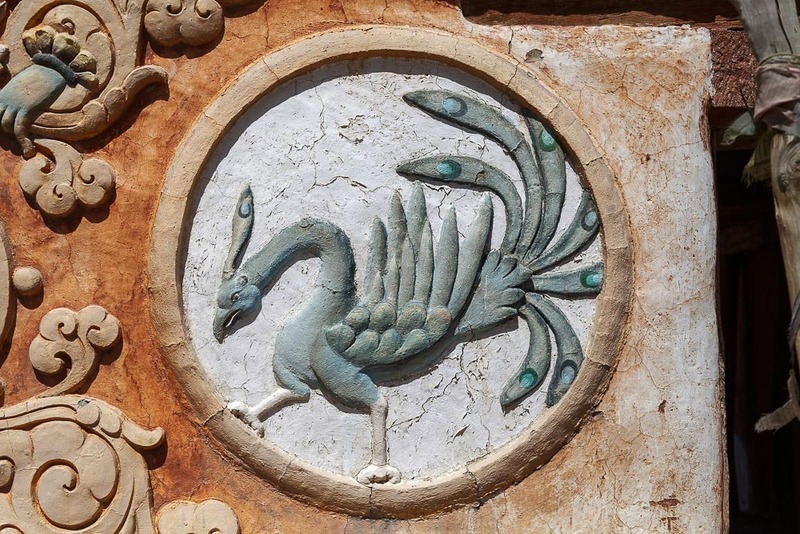 We did spend about 10 – 15 minutes making our way around the large room, marvelling at the artwork – the thangkas, the wall paintings, and statuary. Short of having a voice recorder to note your observations as you take it all in, there is no way you can remember the scene. Not only was I overwhelmed by what I was seeing, but I only half-understood most of it! 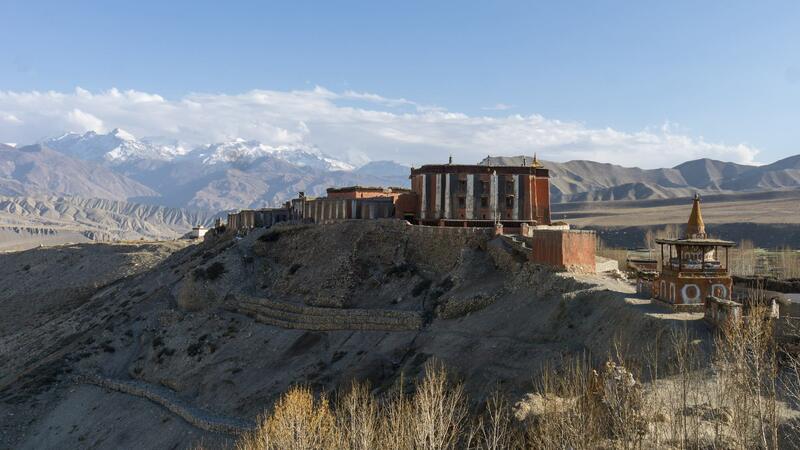 Now add to my memory visits to the monastery in Kagbeni and the one at Lo Gekar and, other than an overall WOW feeling for having visited, I could not tell you exactly what was there! 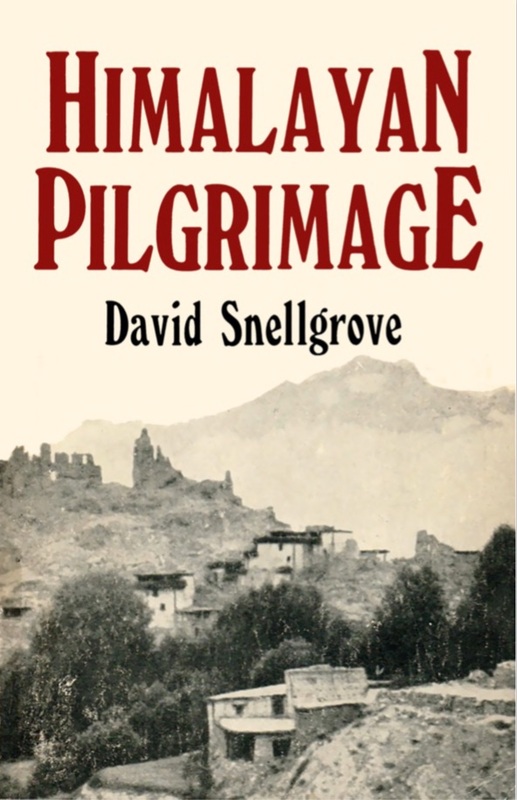 When I got back home after the trip, I did find a copy of David Snellgrove’s Himalayan Pilgrimage: A Study of Tibetan Religion By A Traveller Through Western Nepal. It is a detailed recounting of his 1956 travels through a Nepal that had just been opened to foreigners a few years before. That it describes a Himalayan culture as it existed sixty years ago adds another layer of fascination to an already-readable account. Click on the book title to access a digital and downloadable copy of the book from The Internet Archive. 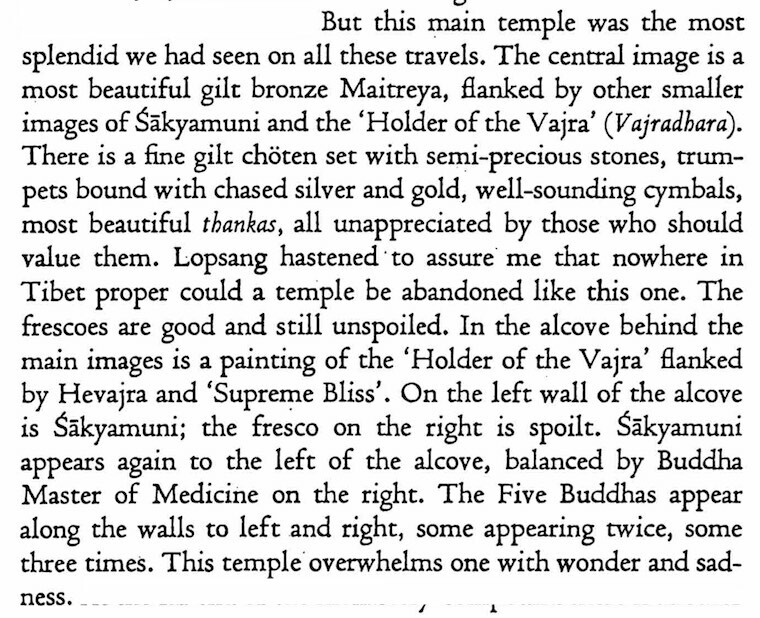 Here is Snellgrove’s remarkably detailed account of the inside of the monastery temple as he saw it in 1956. You have to wonder how much of what Snellgrove saw all those years ago is still in the temple. 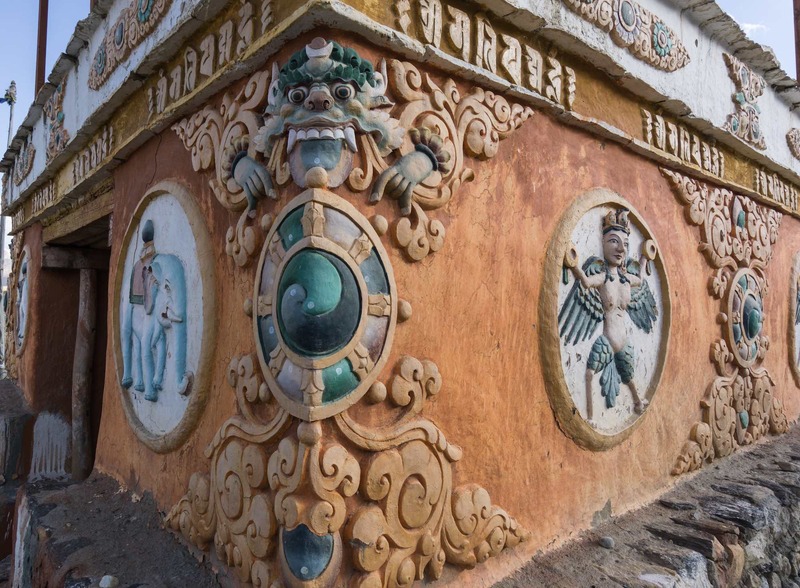 Statues and thangkas are easy enough to remove and sold off to buyers in search of exotic Tibetan Buddhist artifacts. Hard times would give the monks themselves a reason to sell off an item or three to keep their monastery alive. 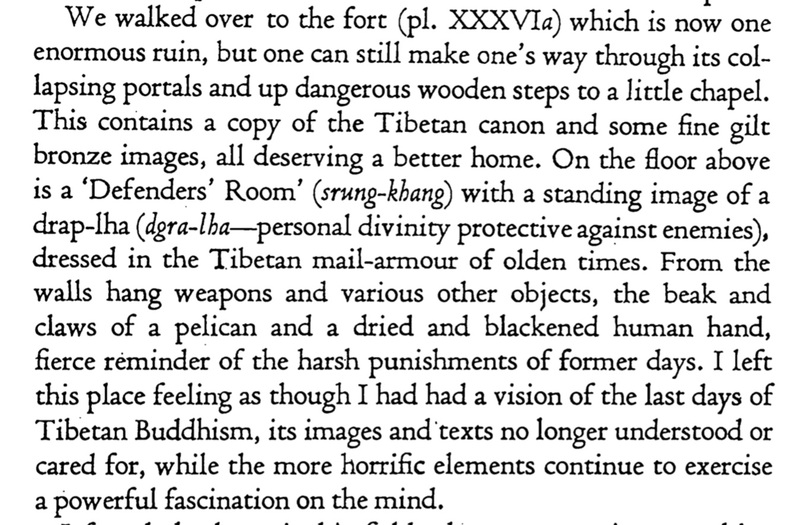 See here for a pdf extract (1.5 MB) of Snellgrove’s account of his visit to Tsarang’s monastery. There was a 200 rupee entrance fee charged at the monastery. It would be another 200 at the dzong, the fort-like royal palace across the way and, again, no photography was allowed. In the case of the palace, it really didn’t matter given that it is all but empty of the things that would have been there when it was a living building and the all-in-one political, military, and religious administrative center for the area. Our guide translated what little the watchman had to say as he took us on a brief tour of the various rooms. 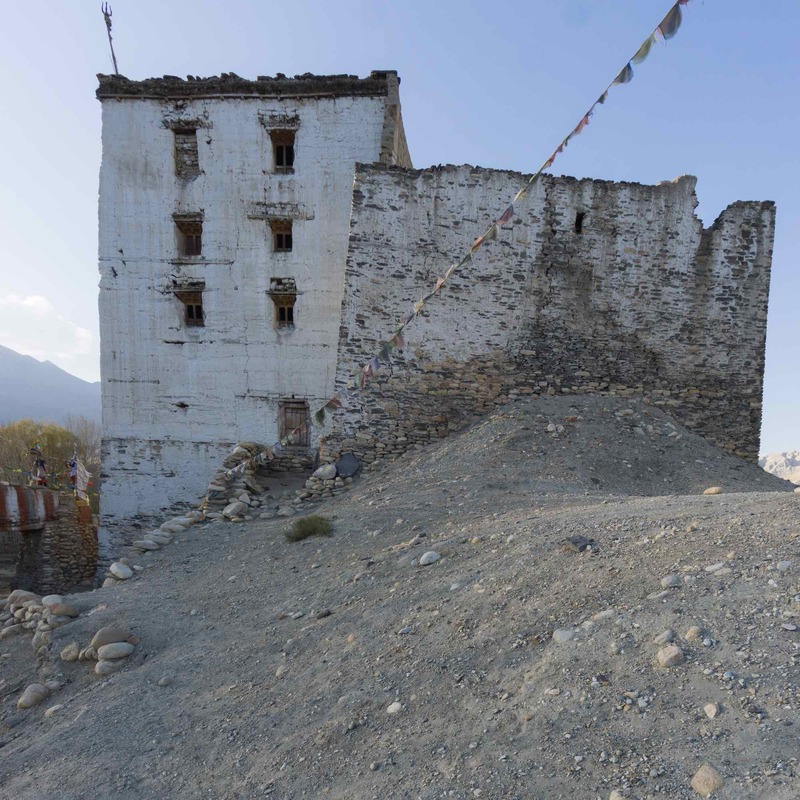 Built in the 1370’s and once the palace of the ruler of the Kingdom of Lo as well as holding an impressive collection of manuscripts in the kingdom, the dzong now is empty and sorely in need of some maintenance. 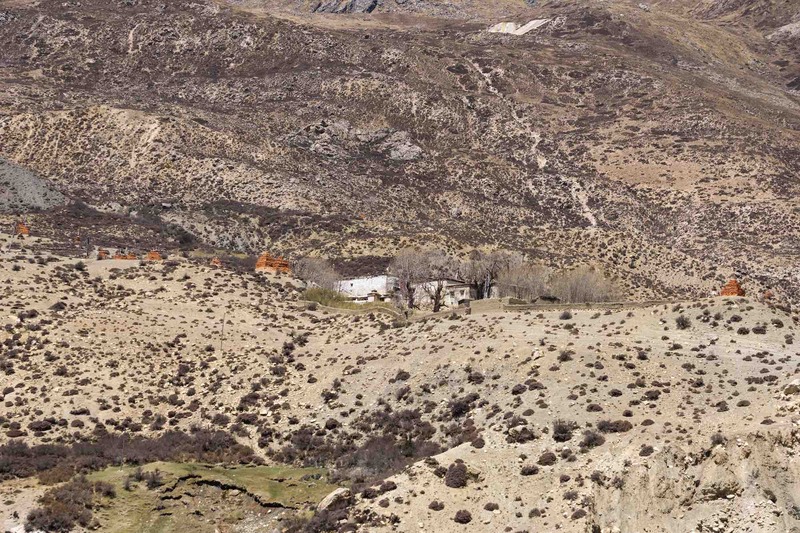 The 2015 earthquake only made things worse; we noticed visible cracks in a few of the walls. Meanwhile, the “books” are gone as is any of the furniture and decoration which may have made it a royal residence. We did get up to the top floor to view the famous desiccated hand of – depending on the story being told – a monk or a thief or the building’s architect. The man on duty did pick up a series of random objects – an urn, a knife – and attach to each an anecdote about some king. You just knew that this was not a history lesson! 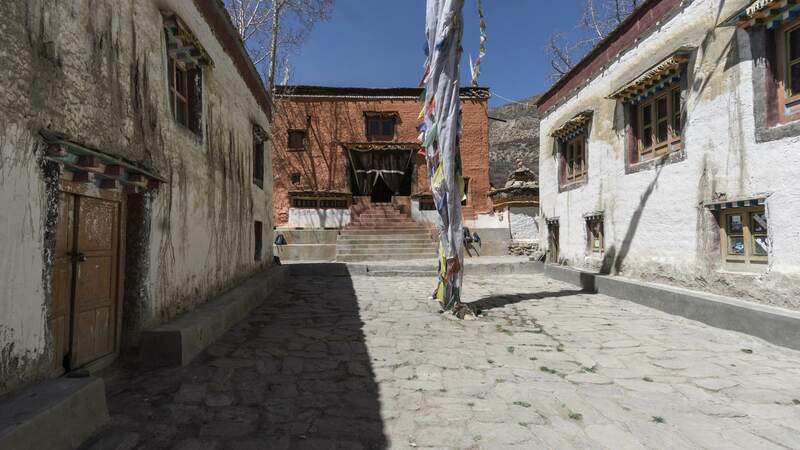 A 7-kilometer morning walk mostly on a road up the west side of the valley from Tsarang brought us to Ghar Gompa. 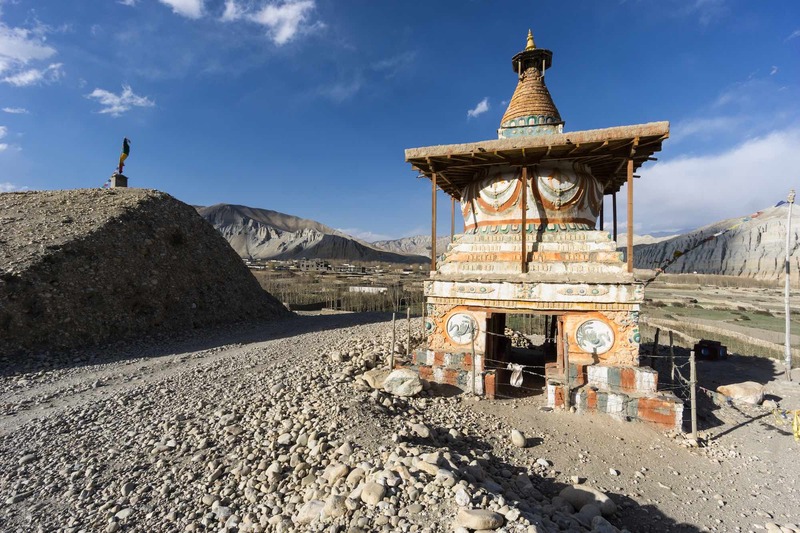 It sits right on the trail from Dhakmar to Lo Manthang and visitors to Lo Manthang can pay a visit either coming or going. On the other side of the Tsarang Khola from our west side path is the village of Marang; we would walk through it on our way back to Charang. 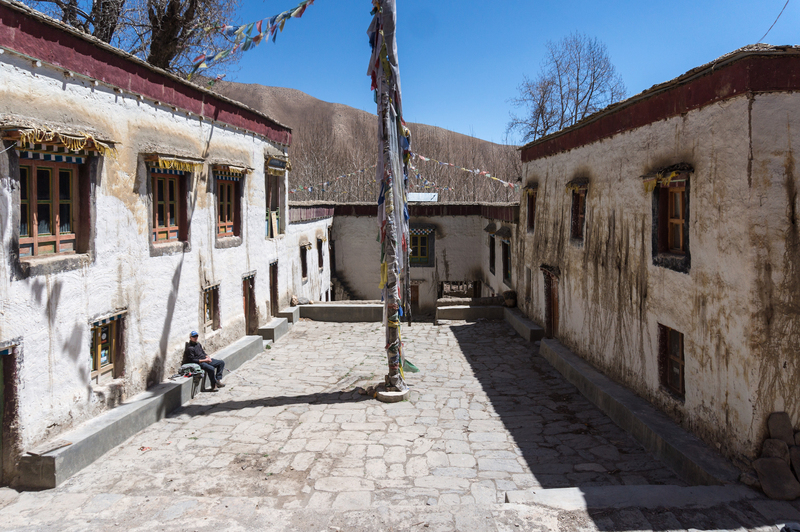 The monks of Ghar Gompa belong to the oldest of the four major schools of Tibetan Buddhism, the Nyingma (“The Ancient Ones”). 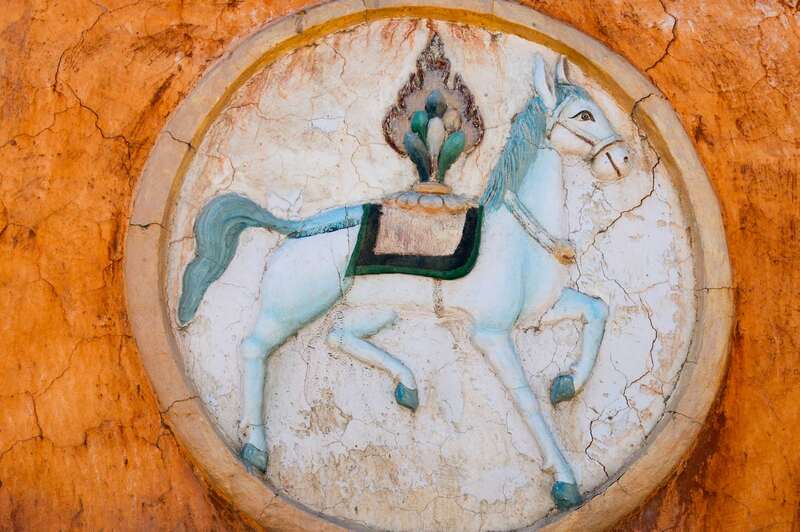 It is said that the lineage was established by the Indian Buddhist Padmasambhava (“the Lotus Born”) in the 700’s C.E. 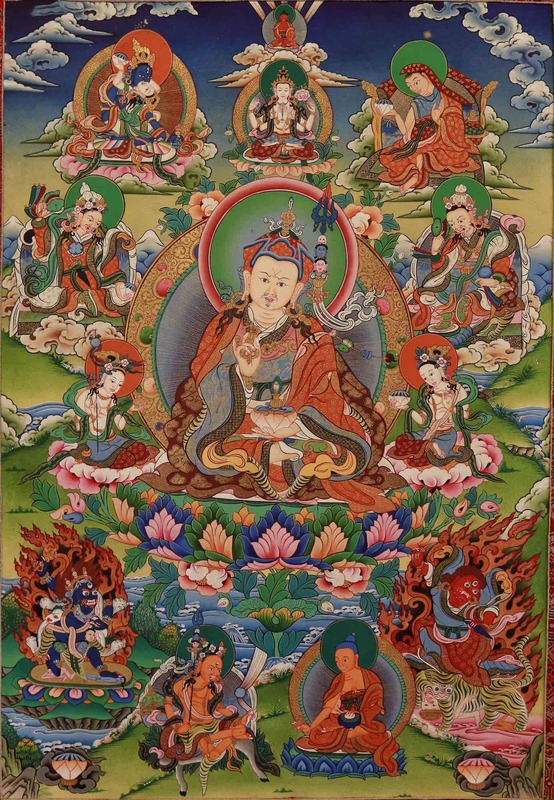 He is known in Tibet as Guru Rinpoche and is considered the Second Buddha following the historical figure (560-480 B.C.E.) we know as Siddhartha Gautama. 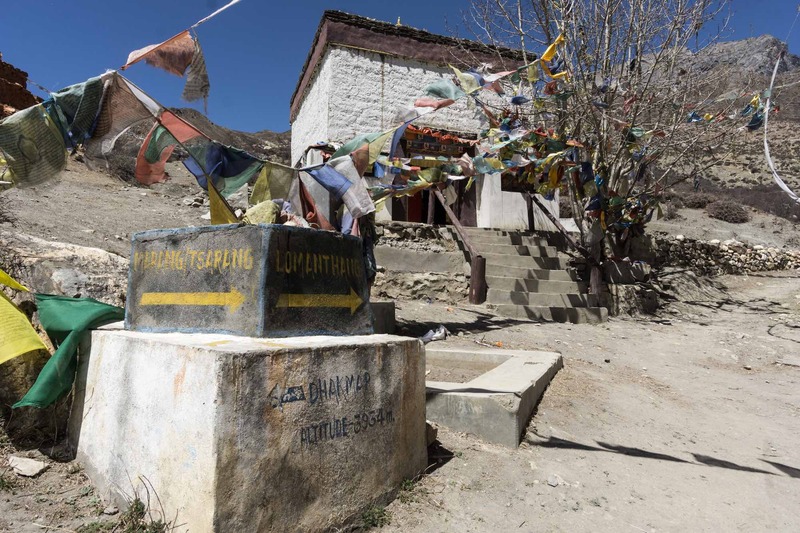 The following info board connects Rinpoche to the building of this gompa after an epic struggle with local demons resistant to the Dharma. Having noted the red cliff near Dhakmar and the long mani wall on the outskirts of Ghami the day before, I was impressed with the creative use made of local geological and cultural features in the demon dragon story! 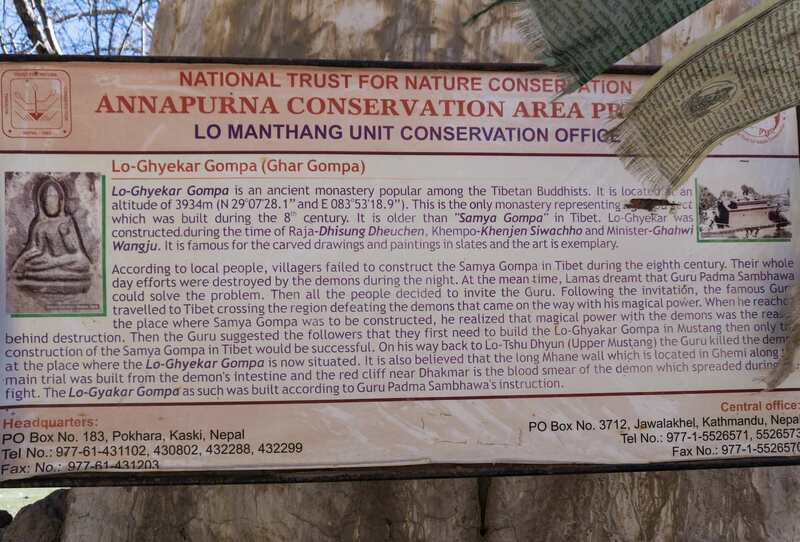 I also wondered who had taken the time to scratch out the name of the Buddhist sect associated with this gompa. We spent some time at the site and with one of the monks as an opener of doors and guide, entered the main shrine room behind the black curtain you see in the image below. Again, no photography was allowed inside. 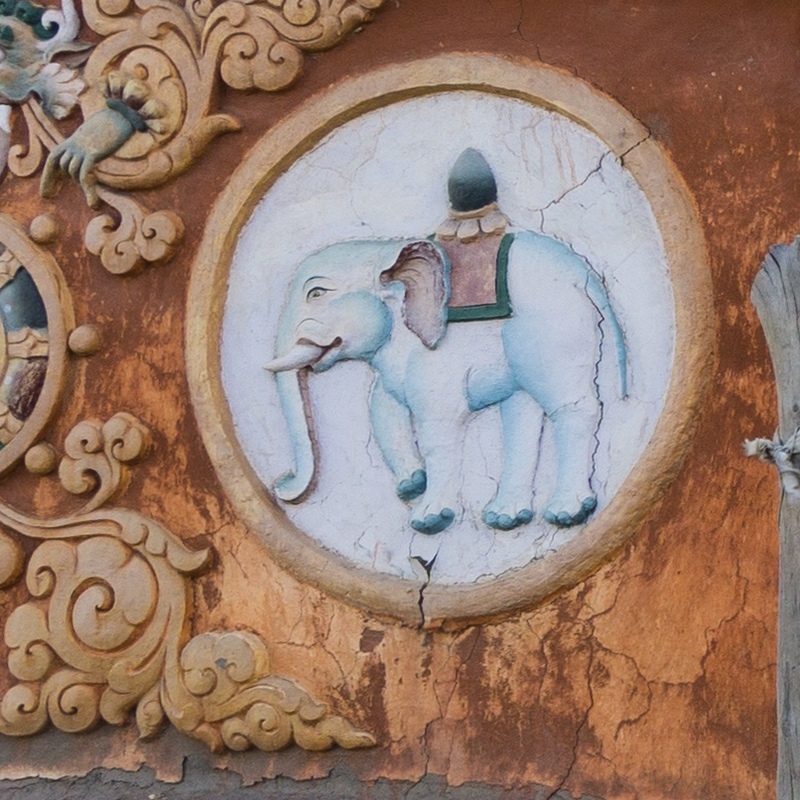 We were taken away by the age-old feel of the wall paintings and the statuary. However, the room does get active use from the group of monks living here. Noting the wool blankets on the benches behind the row of low tables, we were told that during night-time sessions it got a bit cold and the monks would bundle up. I did not confirm this but think that you can overnight at the monastery. 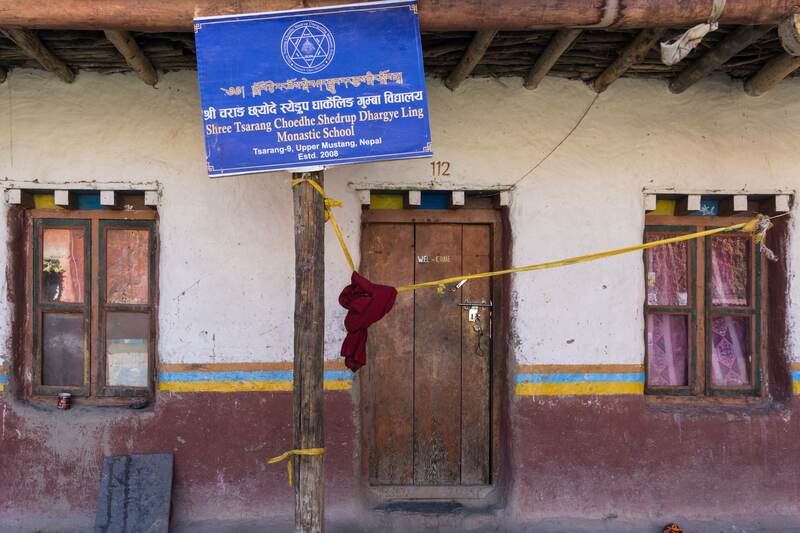 The building to the right of the monastery has windows with a dozen stickers from various trekking agencies. When we arrived, we met the Italian group that we had chatted with the afternoon before at Nyi La. They were sitting in front of the white-washed building, and their donkey was loaded and ready to go. 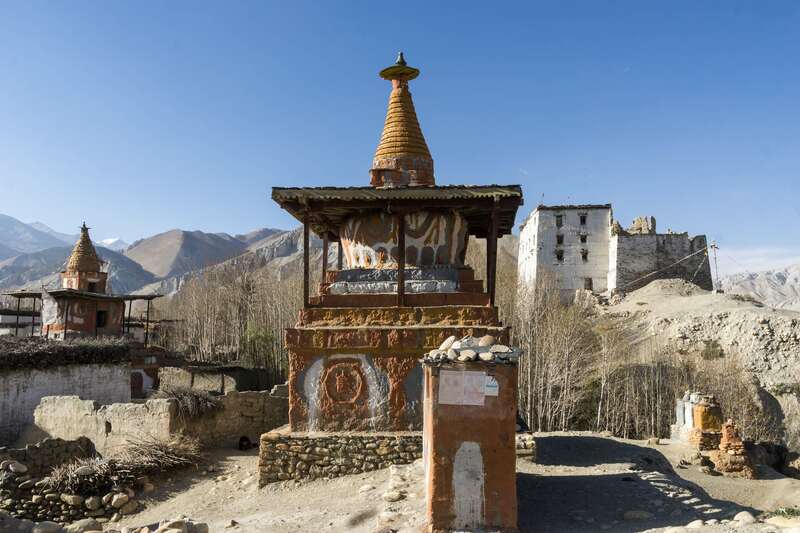 This gompa is in better shape than the one in Tsarang. Note, for example, the new concrete steps leading up to the main shrine rooms on the first floor. 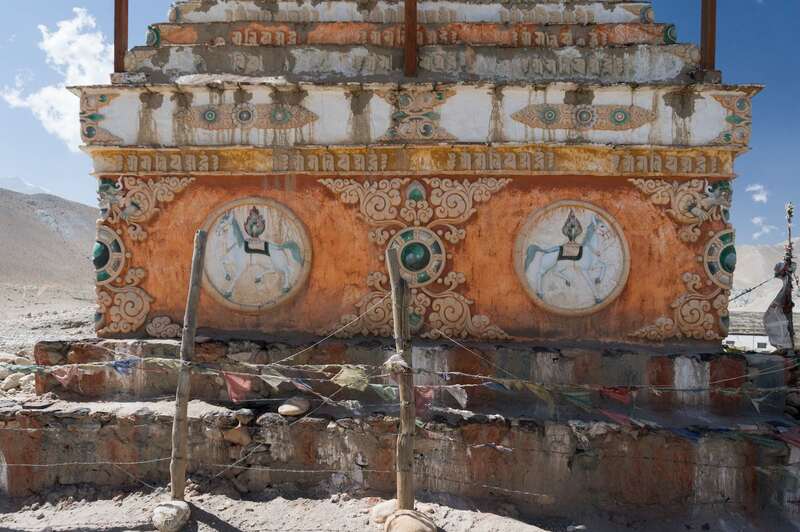 Unlike at Tsarang, all around the Ghar Gompa site, there is evidence of repairs and upgrades to the structures. It must have better access to a funding source outside of Mustang! 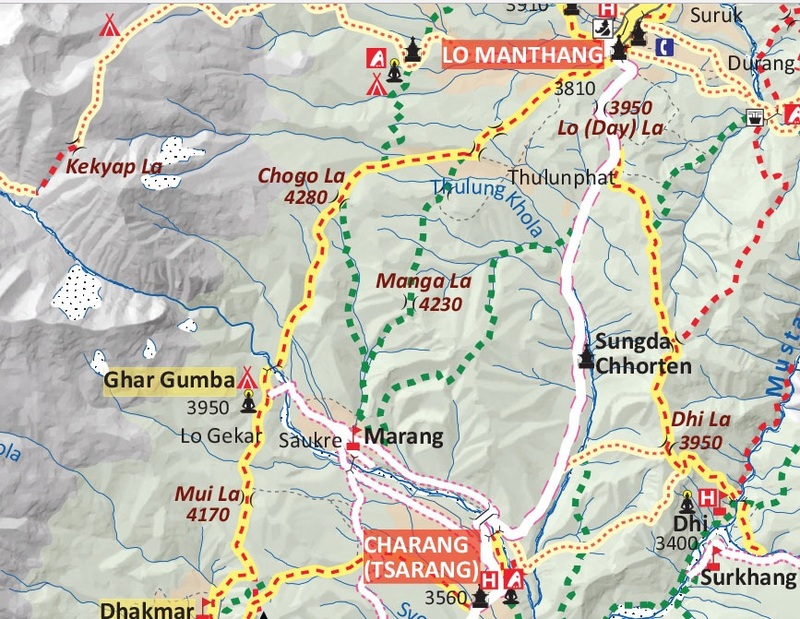 It is 2.5 kilometers down to Marang from the gompa; another 4 km. and we were back in Tsarang. Not only had we seen Lo Gekar, but we had also done a beneficial acclimatization exercise. The gompa is about 440 meters higher than our campsite in Tsarang and any time spent during a day at an altitude higher than that evening fits in with “Walk high, sleep low”. 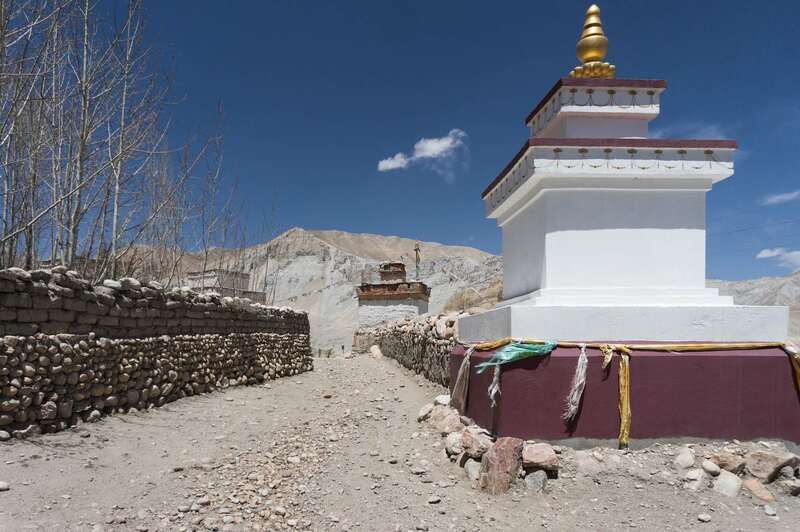 We wouldn’t go as high again until we reached Luri Gompa a couple of days later. 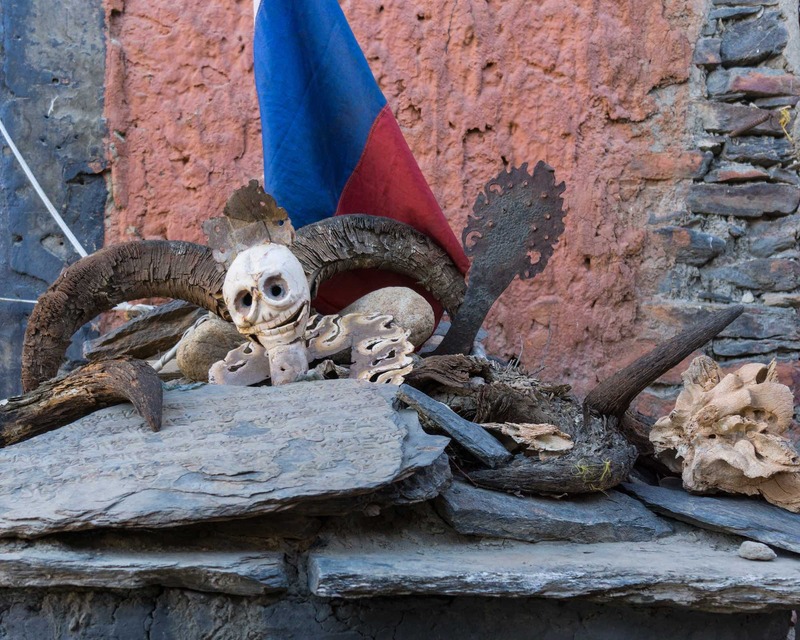 As we passed through Marang, the hammer and sickle painted on the wall was a reminder as to which political party was most popular in upper Mustang – the Communist Party of Nepal, Unified Marxist-Leninist! In fact, the leader of the party – K.P. Sharma Oli – is Nepal’s current Prime Minister after his party’s showing (33% of the popular vote and 44% of the seats) in the February 2018 National Assembly Election. 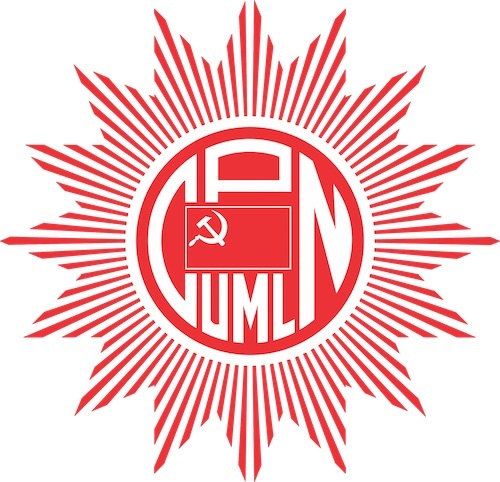 In the Provincial Assembly Elections (Mustang is a part of Province 4 with its administrative center in Pokhara) the winner, the candidate elected in upper Mustang, was Indradhara Bista, also a CPN-UML member. 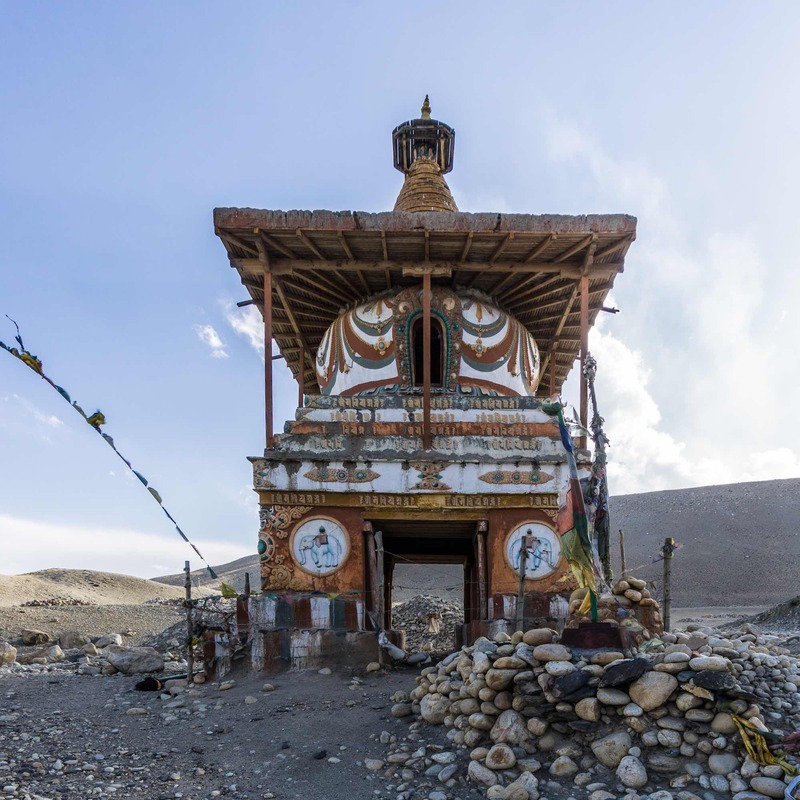 This entry was posted in hiking/trekking, Nepal and tagged Charang chorten, Charang gompa, charang palace, Ghar Gompa, Guru Rinpoche, Himalayan Pilgrimage, Lo Gekar gompa, Marang, Maya's Inn Tsarang, snellgrove charang. Bookmark the permalink.